Starfruit Fun Facts and Recipes Vegans Eat What? When we need a fruit packed with vitamin C we tend to reach for an orange. Well how about reaching for a super cute and delicious Starfruit! 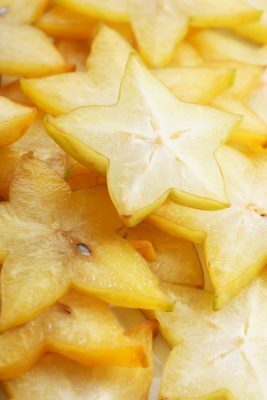 Cut Starfruit in fairly thin slices. Mash together some of the papaya pieces that did not cube so well with some whole flax seeds, raw shredded coconut and cinnamon. Feel free to add chia seeds or hemp seeds if you would like! Cook some oatmeal, quinoa, amaranth or millet according to package directions. Put in a big bowl and arrange the tropical fruit party on top any way you would like. Enjoy your beautiful creation out in the sunshine for that real tropical feel no matter where you are! Even a super ripe Starfruit’s sugar level will never pass 4%, bringing the kids bonkers level to a minimum! I guess this could be a fun fact for grown ups as well. Starfruit provides 57% daily need for Vitamin C so kids can fight off all the germs they are surrounded by all day at school! Starfruit is so cute and fun that kids won’t be able to resist indulging in this super healthy snack! Starfruit has 3 grams of dietary fiber, 11% total RDA, so you won’t get so hungry so quickly! The anti-oxidants in Starfruit help flush out irritating free radicals that try to destroy your beautiful, radiant and elastic complexion. Free radicals not only destroy your beauty or handsomeness but they also damage DNA of cells. When these damaged cells multiply and invade healthy cells, cancer begins to rear it’s ugly head. This blog was written by Vegans Eat What? guest blogger Sara B Fit of www.recipeswithasideofexercise.com. Note from VEW: Starfruit is usually eaten raw and the entire fruit is edible although some choose to remove the inner seeds. 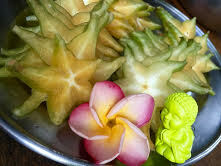 Starfruit can be purchased at many grocery stores and Asian markets. Sara is the founder of Recipes with a Side of Exercise (www.recipeswithasideofexercise.com), an innovative program that leads kids and grown ups on a journey of bonding through food and movement. Sara is a Colorado native who enjoys everything this beautiful playground has to offer! She loves teaching kids of all ages how to prepare delicious plant based recipes and how to move their bodies! As a long time nanny and preschool teacher, she soon got the grown ups of the families to participate as well! Her mission is to show that you truly do have time for it all! BFit, BHealthy, BYou!